My website has gotten a fresh and beautiful makeover (thanks to my dear and talented friend Hope), and I'm excited to show you all the newness in store! I'll keep the chatter light and the photos heavy here on the blog. If you'd like to peek, click the image on the sidebar. ALSO! 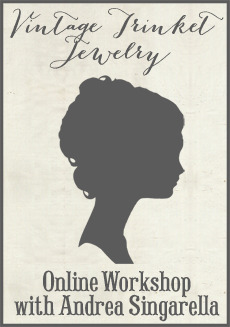 I'm excited to be offering an online jewelry workshop to all of my customers! I hope this will be the first of several workshops I can offer you. Click the button on the sidebar and it will take you straight to the workshop page, which will give you all the details. You can also CLICK HERE for more information and to purchase the course. Teaching at workshops around the country has been a blessing to me in many ways: I've forged new friendships, learned from others, shared my creative journey with students, and been inspired by many along the way. I realize not everyone is able to get away and attend these workshops, and I'm hoping this online workshop will offer you a chance to learn the basics of jewelry making and inspire YOU to create your own beautiful pieces from home. This picture was taken a couple days ago on Sofia's first day of preschool. And so another school year begins! I can hardly believe I now have a 3rd grader, a Kindergartener and a Preschooler. These three were so ready to get back to school and start the routine that Autumn brings. And as sad I was to send them off that first day, I must admit, these precious few hours (Sofia only goes half days, three days a week) have proven quite productive! The house is so QUIET. I've been cleaning, and getting organized and (gasp!) making jewelry! A few new pair of Ear Drops to start, and little by little I'll be adding to my shop as the fall continues. These will be in the shop sometime today. In this collection I used old religious medals, lots of rhinestones, chuncky Amazonite beads and some vintage pearls. It's a beautiful mild day here today, perfect for a lunch outside. I think that's where my girl and I are headed after I pick her up from school. In the midst of the wonderful hustle and festive bustle of the season, I decided to make one last collection of jewelry in time for Christmas delivery. There are new Ear Drops and necklaces and lots of winter sparkle. As long as orders are placed by Sunday, Dec 16th, I will ship in plenty of time for Christmas gift giving! I hope you're loving this wonderful season and enjoying the company of family and friends as we prepare for December 25......only 14 more days! I have been a busy girl making this collection of fancy new Ear Drops just in time for the holidays. I'm so happy with the way these pieces turned out, with that little extra sparkle, wire wraps and soft pastel palette. I happened to have extra quantities of a few of the components and was able to make 2 sets of some of these designs. If you want to have a look, click here to visit The Shopette. Thank you to all of you gals who have placed custom orders. It's been such fun creating special pieces for you! For a few years I have been asking myself if I should consider taking custom orders for jewelry designs. Truth be told, there was always that little bit of fear that it would become a "job". I worried that I'd lose the passion I have for designing and creating as my form of artistic expression. Well, I have quietly been accepting custom jewelry requests from customers for the last few months, and to my great surprise.....what a JOY to be able to design a piece that is exactly what these customers are seeking. I am loving it. Now that 2 of my children are in school, at least part time, and Sofia still takes a nice long nap, I am so enjoying sitting down at my jewelry table and feeling inspired and excited about what I am doing. So, it's a big step for me, but one I am really excited about taking! If there is a piece you have seen in my Shopette that you liked and would like something similar, I can do that. If you want a necklace with specific colors, charms, medals....I can do that also. As long as it's something that is true to my design style, I would love to create a piece for you! The Made-to-Order Menu includes: Necklaces, Bracelets, Ear Drops, Bookmark Baubles, and Rosaries as well. Simply contact me through the "Say Hello" link on my home page. My business has been quite an evolution, and I am so grateful that it has led me here. Thank you friends, for your support and encouragement all these years! Just a little post to let you know I made a couple of new pieces that are now in the Shopette. You can find them here. It's amazing what can get done when I wake up at 1:30 in the morning and can't get back to sleep! Hello Friends! Just wanted to let you know I have some new necklaces, bracelets and ear drops in the Shopette now. Click here to take a peek! Thanks, as always, for your support and sweet words about my designs. Well hello! It's been awhile. I hope you enjoyed Summer and all it's carefree days and beauty. We had a great time at the beach and hit just about every festival, parade and fair within a 5o mile radius. But, alas, all good things must end eventually. And so it's back to school for the kiddies and a little more "free" time for Mama. I've been making time to create jewelry these past few weeks, and plan to have these pieces in the shop in the next week or two.